10 years ago, we had nowhere near as many avenues for getting news. Whether it be global news, national updates, or local events, we can get news from more outlets these days than we can keep up with. This one is a given, and has been a staple for longer than most of us can remember. In years past, the delay was much longer, but with most newspapers having sites online, the news is always up to the very minute. Another obvious news source, but in greater capacity these days. With designated channels for every sport and even for entertainment, getting news from the television has increased over the years. We even have 24-hour news channels, so information is available around the clock! Telecasts are also available online. What an amazing creation?! 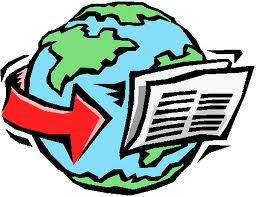 We can not only get news all day, everyday, but can discuss it instantly with people across the world. Sharing news via Twitter is one of, if not the most bountiful way to share what's going on at any given moment. Just as quickly as we can get news from Twitter, we can get the same, along with opinions and even pictures from Facebook --mainly statuses. Facebook has not only allowed us to reconnect with people from our past, share pictures in the present, and plan for the future, but also generate commentary on what's going on in the world. This social network is an amazing news source. You'll surely find people reaching for their computer or smart device to find out "what I've missed". These customizable Rich Site Summaries are great news sources as well. They allow you to subscribe to your favorite news outlets and receive live updates in a portal like Google Reader, iGoogle, My Yahoo, or others. You can subscribe to your favorite daily paper, blogs, and other sites offering their news for easy access. RSS Feeds are a great way to stay in the know. Know of any other great news sources of this age? We always talk about how fast technology is moving, so surely there'll be more where these came from.